Gahhh! As an avid Pez collector I always think my collection is near complete and then the Pez innovators throw out a new surprise. 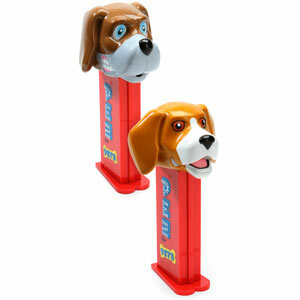 Meet the Pez Pet Dispenser. Standing at 10" tall, each comes packed with 6 canine treats with refill packs of 12 for purchase. Beagle head or hound head avails - though I cant understand why they didn't go with a classic Snoopy or better yet Scooby Doo with Scooby Snack refills. Either way this gives me an excuse to buy a Bat Dog.